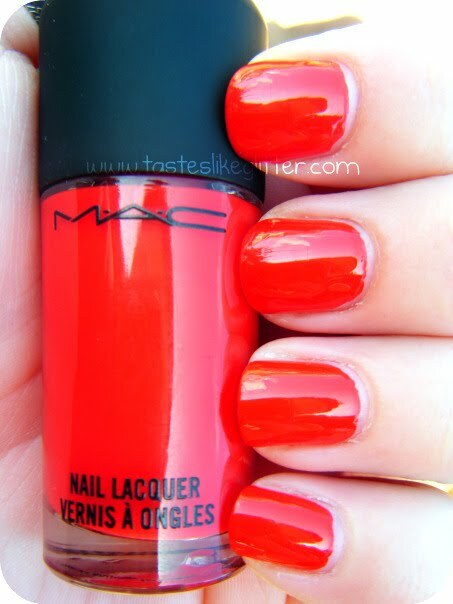 I know there's a lot of people who always insist they have trouble with M.A.C polishes. Now I only have 4 but I've had no trouble with any of them. No streaking, no nothing and Shirelle has to be the best out of the lot. It literally is the brightest red I have ever seen. I thought it looked too much like Nails Inc. - St James at first but it that has a slightly more orange tone to it and a horrid formula. Whereas this applied amazingly! No streaking what so over and full opaqueness in 2 coats.